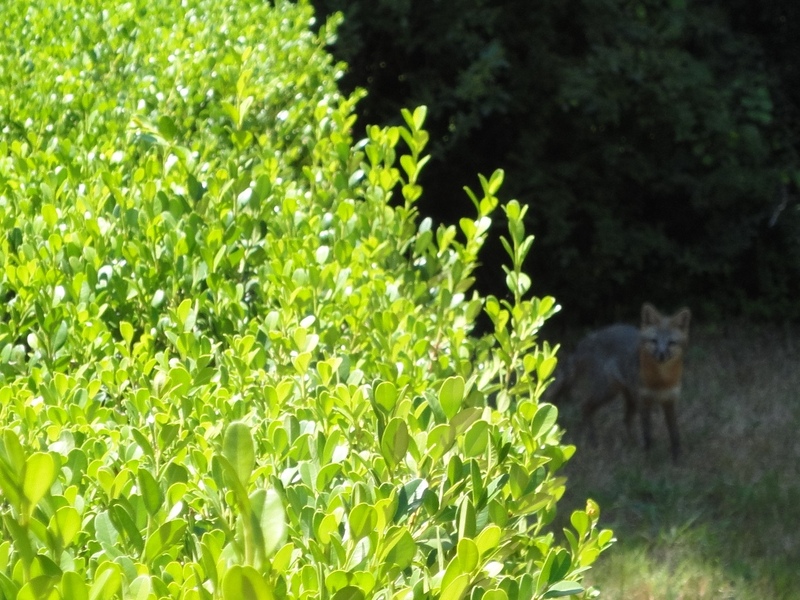 Today we had a fox visiting the shrubs in our front yard. Come on, little guy! This is a big city and foxes don’t do this. Okay, so we do have a 350-acre wilderness at our back door. Last summer we had a gray fox drinking from the bird bath. We spotted this bold fellow out the office window, marking his territory. Anxious for a closer look, a longer look and maybe a lucky shot with the camera, we tried to sneak out the front door. The only reason we got this picture at all…well, it wasn’t because we were sneaky; it was because this little guy was as unfamiliar with and curious about people as we are about foxes. He stood frozen for drawn-out seconds, staring dumfounded as I pointed the camera, zoomed in and clicked the button. I didn’t get a second chance as he slunk back into the bushes. I found myself wishing there were some kids around to share this moment with. Then I remembered the Internet. Enjoy, kids! Can anyone tell me if this is a gray fox or a red? He has both colors but he’s pretty small for a gray. Any creative thoughts about why he was out in the front yard in the middle of the day? This entry was posted in Uncategorized and tagged animals, fox, front yard, kids, nature, outdoors, wilderness, wildlife. Bookmark the permalink. He is, Jessica! I just wanted to cuddle him. Daniel took him a slice of turkey. (Of course he was long gone by then.) We frequently throw apple cores & over-ripe fruit over the back fence, knowing “somebody” will eat it. Great post, Janet. Love the fox. If you’re looking for more stories about displaced animals turning curious neighbors, here’s mine. We live on 31+ acres that is just north of the Claremore city limits, and half our property is woods. So every displaced living thing seems to come stay with us. We have about a dozen head of deer (they wander back and forth between ours and our neighbors’ property, using the woods as their magic doorway. We have a beaver that lives in the itty-bitty pond we have along the main road, and when it dries up he climbs about 25 feet (we live high on a hill, but the road is about halfway down the hillside), then waddles across our land (right by my office window) to cover the 1/4 mile or so distance between our pond and the neighbor’s larger one, where he retreats until wetter whether (we figure he tires of living with the relatives and wants to get back as quickly as possible to his own little wet hermitage). We a turtle can comes by at least once a week because he knows I’ll feed him banana pieces (yes, turtles love banana). He’s a big pond turtle, but not a snapper, and he can somehow climb stairs–I don’t know how, and I’ve yet to see him do the marvelous trick, but somehow he miraculously ends up at my side porch door, and the only way to get there is to climb two regular sized cement steps. The only animal we actually own (well, it’s a cat, so I guess she owns us) is Mischief. She just turned 16 years old and is an indoor/outdoor kitty and pretty asocial to anything else that moves (I’m tolerated, but my husband is still on probation). We have two tomcats–originally feral–who wanted to get to know her better until they realized she was tougher than they would ever be (even though she weighs half of either of them). But I fell in love with one of the toms and started feeding him–it took him six months before he would let me pet him, and more than a year before I ever heard him purr. Now he’s my best buddy, and follows me anytime I go outside, staying on my heels like a good lab. But feeding him (and the other irritating tom) like I do each day, means that any food left overnight gets eaten by either the two raccoons or the three possums that come go scavenge every night. Oh, and we have a bird family living on top of the light/lamp just outside the front door. As far as foxes go, we had a black fox come by here a few years ago–gorgeous. And a family of foxes lives in my neighbor’s decrepit barn. Just last week I was driving down our long drive, and noticed the mama fox crossing ahead of me with one of my neighbor’s guinea hens in its mouth, taking it to feed the family–the guinea was about as big as the mama fox, and the fox had to hold her head way back as she ran, so she could keep from tripping on the bird. I’m going to check back and read about more fox sightings, Janet, so keep us posted. Love to hear these kinds of stories! As you can tell by my story, cat food seems to be a universal food too [laugh]. I love beavers, too. Did you know they mate for life & mourn the loss of a mate for years? A beaver story would make a great kids’ story. Hmmm. Since my “Fox” died last year, you can borrow his theme song for YOURS! BTW, I just heard Lobsters mate for life! I know some birds do too— I think cardinals, robins and a few others. Elephants mourn their dead; dogs sometimes do as well. I used to know a bunch of animals that mated for [life] when I was in marriage ministry some years ago— darn shame the species homo sapiens sapiens no longer does!